In order to remain relevant and a leading service and solution provider in the GIS industry for almost 20 years we constantly have a need to adopt new technologies, push the limits, and add complementary tech and services to our offerings. GEO Jobe has been integrating UAV / UAS data capture into a number of projects enabling quick turn-around and cost savings for clients. What this means is that in addition to being experts in the ArcGIS / ArcGIS Online space we can offer our clients custom application development services, GIS analysis, expertise in ArcGIS Online, Enterprise, and Server (as well as our GEOPowered Cloud solution), and a host of GIS services and solutions. This also includes high resolution, 3D data capture and aerial mapping of project areas and facilities using UAVs. 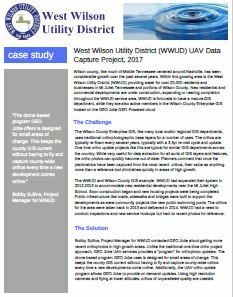 Recently, we completed a UAV data capture & ortho update project for the WWUD. Wilson county, like much of Middle Tennessee centered around Nashville, has seen considerable growth over the past several years. Within this growing area is the West Wilson Utility District (WWUD) providing water for over 20,000 residents and businesses in Mt Juliet Tennessee and portions of Wilson County. New residential and commercial developments are under construction, expanding or nearing completion throughout the WWUD service area. WWUD is fortunate to have a mature GIS department, while they are also active members in the Wilson County Enterprise GIS hosted on the GEO Jobe GEO-Powered cloud. The Wilson County Enterprise GIS, like many local and/or regional GIS departments, uses traditional orthophotographic base layers for a number of uses. The orthos are typically re-flown every several years, typically with a 3-5yr re-visit cycle and update. One time ortho update projects like this are typical for similar GIS departments across the country. While very useful for data extraction for all sorts of GIS layers and features, the ortho photos can quickly become out of date. Planners comment that once the planimetrics have been captured from the most recent orthos, their value as anything more than a reference tool diminishes quickly in areas of high growth. The WWUD and Wilson County GIS example. WWUD had expanded their system in 2012-2013 to accommodate new residential developments near the Mt Juliet High School. Soon construction began and new housing projects were being completed. Public infrastructure like roads, sidewalks and bridges were built to support the developments as were community projects like new public swimming pools. The orthos for the area were taken back in 2013 and delivered in 2014. WWUD had a need to conduct inspections and new service hookups but had no recent photos for reference. Bobby Sullins, Project Manager for WWUD contacted GEO Jobe about getting more recent orthophotos in high growth areas. 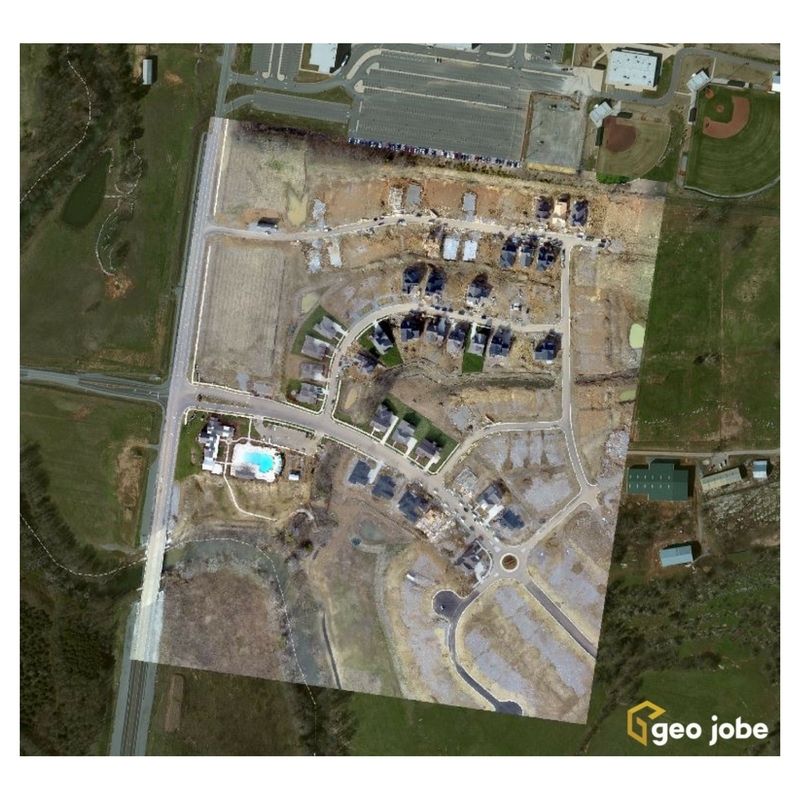 Unlike the traditional one-time ortho project approach, GEO Jobe UAV services provides a “program” for orthophoto updates. 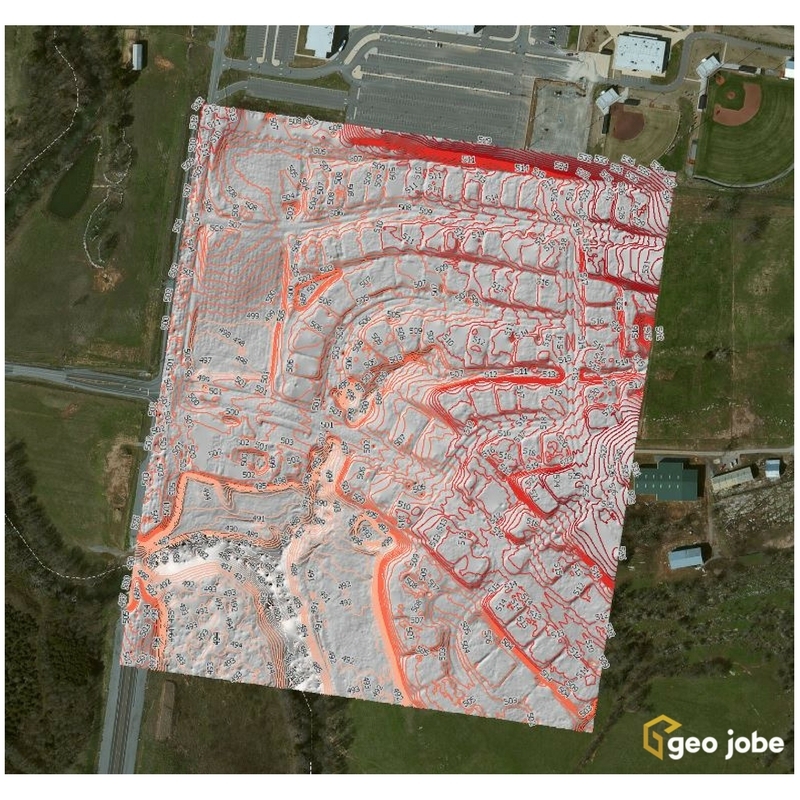 The drone based program GEO Jobe uses is designed for small areas of change. This keeps the county GIS current without having to fly and capture county-wide orthos every time a new developments come online. 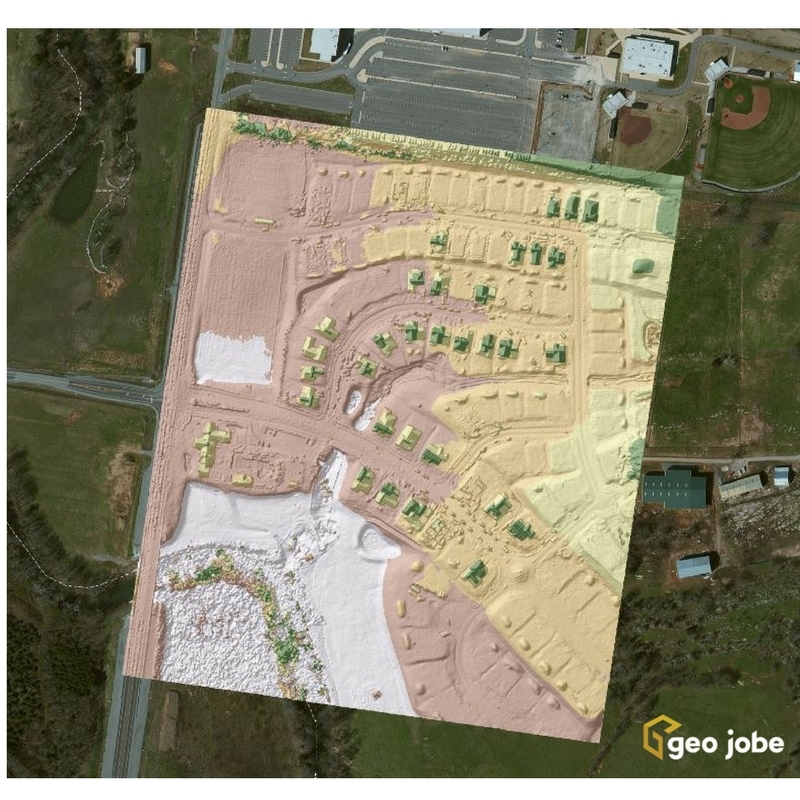 Additionally, the UAV ortho update program allows GEO Jobe to provide on demand updates. Using high resolution cameras and flying at lower altitudes, orthos of unparalleled quality are created. Wilson GIS users now have access to current, high quality orthos that make it easier and faster to extract data and update their planimetric layers like sidewalks, edge of pavement, curbing, driveways, swimming pools, and the actual house locations for addressing in the 911 database. When GEO Jobe UAV collects orthos for a site as part of the program, they set centimeter level ground control accurate to less than one inch. The high resolution camera collects half inch ground sample distance (GSD) which processes out to 1 inch pixel resolution. Taken together, this produces a highly dense 3D point cloud, accurate model reconstruction that is tied tightly and accurately to the ground. 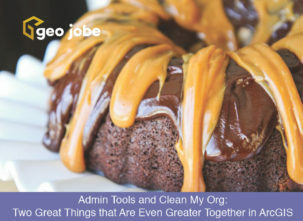 It also allows GEO Jobe to provide 1 ft contours as part of the site deliverables. Besides the photo, the DTM and contours, GEO Jobe also delivers a Digital Surface model (DSM). Wilson County is now in the fortunate situation where instead of the Orthophotos being the most out of date GIS layer, their Orthos are leading the change detection and data capture processes. The program is far less expensive than a traditional ortho project. When a traditional ortho project is used, much of the area covered hasn’t changed since the last flight and photos. Wilson County is paying for Ortho Updates only for the areas that have changed and need updating. 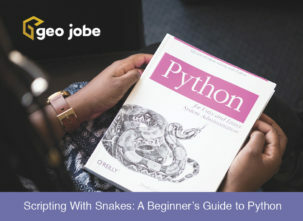 When Wilson wants another area flown for updates, GEO Jobe can fly and deliver the final data and products with a quick turn-around, often in less than one week! Traditional Ortho projects can take from 3 to 9 months for processing and delivery, meaning that most recent Orthos from the “current” traditional project can be out of date as soon as they are delivered!